Robert Von Hagge's creation at Seignosse is the most prestigious in the South West of France, and was recently ranked the 15th best course in continental Europe by Golf World magazine. 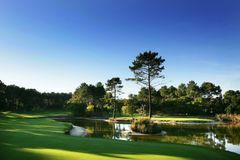 The perfectly manicured fairways of this fine French layout are bordered by impressive pine, oak and cork trees, while the undulations of the natural landscape provide a number of truly spectacular holes. From the championship markers the course is only 6,741 yards, which is by no means long by today's colossal standards, but Von Hagge's clever design of 1989 still holds true, and his inspired placement of Seignosse's considerable hazards makes it a true test of golf. Golf de Seignosse is always ranked very high in the all time best courses in France's - you'll need to be on top of your game!